Geofencing was one of the newest features Windows Phone 8.1 provided and for the developers it indeed was cool. Previously people did it their way but it’s always better to have an api in our hand. So, before digging into that i strongly suggest you guys to read my previous 2 articles if you haven’t done it already. These two would get you started pretty fast and you’d probably want that. If you already read my aforementioned 2 articles, I expect you know how to use a map control in Windows Phone 8.1. We’re going to need that later. Geofencing is a mechanism where you put a virtual boundary around a specific point of interest and you want to interact with the user when you arrive or leave that specific boundary. You seriously can do pretty amazing stuff with it actually. So, let’s go ahead and create a new Windows Phone app and name it GeoFencingTest. Now, lets see how to do that actually. So, first of all go over your Package.appxmanifest file and go to the Capabilities Tab and select the Location capability. Before going in deep on what is for what let’s get some basic stuff done. Let’s get our current location first. Since you guys have seen in the last articles, it’s fairly easy to do so. 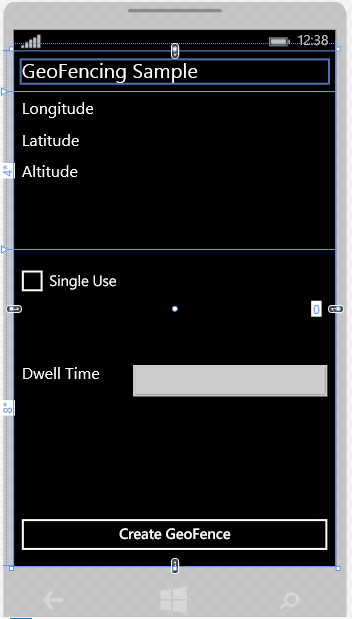 All I’m doing here is get the current location using Geolocator and put the Latitude, Longitude and Altitude into the textblocks defined in the MainPage.xaml. The only thing that is interesting here is having a CancellationToken generated from a CancellationTokenSource. Usually these are used if you really want control over your task after it’s being fired, the rest of the procedure should look familiar as it’s a basic Geolocator usage to find current geolocation. Now, there’s quiet a lot to catch up. The first one is definitely the GeofenceKey. Put a GeofenceKey in position just to identify a specific Geofence. I put s generic string to identify my home geofence. 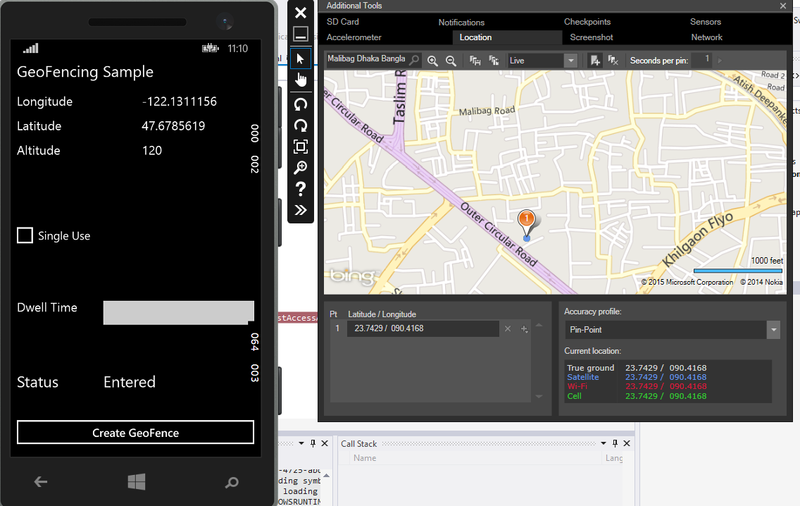 Then I called up GetMyHomeLocation() method to set the geofence center to the location of my room. This will identify the center of our desired Geofence. And the next thing to define is a radius that will define the radius of our circular geofence. We are using Geocircle object to define our geofence here, thus we are using a center and a radius in meters to defined our geofence. You can definitely see the next thing we did is define our geocircle. Actually the Geofence takes a Geoshape object to define it’s radius and currently only Geocircle is supported. Now, we have put a checkbox in our XAML named SingleUse. This is supposed to define whether our geofence would be used for only one time or not. You can set up temporary one time used geofence using this. Now, the next thing we did is we defined how our desired geofence would be treated. Which events are we considering with this geofence? Should this be fired only when we get into that geofence or should this will only be considered when we exit the geofence, or even we remove the geofence? We can actually select all or a subset of that group. So we used Logical OR operator to add up all the cases we want our geofence to react upon. Let’s move on into the time domain now. Now we need to figure how long we need to stay in our favourite geofence to trigger up it’s desired events. I put a textbox in front to define that in seconds, if that is defined, we fire out events from our geofence in that number of seconds and if not we fire out events in our default dwell time defined by 0 seconds. You can even define how long a geofence should be up and running. Like I want my rooms geofence to be running for next 10 days. Well, the only thing left to do is create our desired geofence and add it to GeofenceMonitor. Now, that’s how you create your own geofence and add it to the GeofenceMonitor. Now you might wonder that whether you’d really have to define all that parameters to create a geofence. Not actually, the littlest you can do is define an Id and a Geocircle to start your geofence. 😉 The rest of the values would take the default assumption. We have all our background work to create a geofence but we wont be able to do a single thing unless we test our geofence. Now, we have already defined that our geofence would trigger events after the aforementioned dwellTime and will trigger events if I enter or leave it. So, I definitely have to attach a event handler at a certain place. Don’t I? Before that, let’s create the method stub for the click event handler for CreateGeoFencingButton and start SetupGeofence() method inside it. If you don’t know how to do that, select the CreateGeoFencingButton in XAML, go to properties, select events tab and double click on the click textbox. There you go! That’s how you set up your geofence in an app running in the foreground. Now, this is where things get a little bit tricky. There’s a number of steps involved in this. Create a Windows Runtime Component Project and add it to your solution. Change Package.appxmanifest to declare the BackgroundTask that has been created. Usually, background tasks are windows runtime component so you have to add one to your solution. Please go over to your solution and add a Windows Runtime Project. After the new project is created go over class1.cs and rename it to your liking . I renamed it to BackgroundTask and added IBackgroundTask interface to the class and implemented it. I didn’t write anything afterwards. Let’s just keep it like that for a while and move to our GeofenceTest Project. Go over references and add the newly created GeofenceTask.BackgroundGeofenceTask project to it. 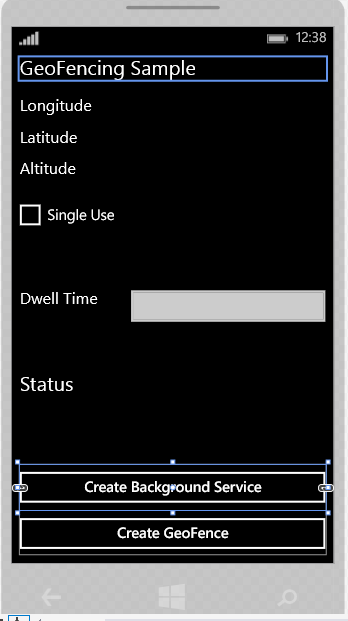 So our Wp8.1 project now has reference to the GeofenceTask.BackgroundGeofenceTask project. Now let’s scoot over to our Package.appxmanifest file and go over Declarations tab. From Available Declarations combobox select BackgroundTask and select loction under the Properties list. Now on the Entry point field please put the full qualified assembly name of your newly created background task. Don’t get confused. It’s fairly easy. Let’s have a look at BackgroundGeofenceTask class first. The next thing that comes off is defining the LocationTrigger for the BackgroundTaskBuilder object. So, we defined a new LocationTrigger of type LocationTriggerType.Geofence and used SetTrigger method to set it up. Then we used BackgroundTaskBuilder object to register the task and we instantiated a GeofenceTask_Completed event handler for that too. At the bottom you’d see a switch with backgroundAccessStatus and putting a MessageDialog when it’s denied or unspecified. Now, this looks a wee bit different from the first example. The first change that is noticable is that we are now selecting the reports based on our geofence id and the report’s new state. As we are in background now, we are using our geofence id to get the proper geofence from the whole list. And as now we are in background we are using a Toast Notification instead of a MessageDialog to show our notification. Now you guys might get confused what to do with the foreground code we made earlier. Do we need Current_GeofenceStateChanged event handler anymore. Now here we might have to be a bit careful. Now if we want our app to react different when it is on foreground and make some UI changes it needed then we have to use GeofenceTask_Completed event rather than Current_GeofenceStateChanged. And there’s another thing to be added. We get our GeofenceMonitor Reports using GeofenceMonitor.Current.ReadReports() and this step can only be done once for every change. So if your background reads it first then, your foreground app would not be able to read it. So, we have to save it somewhere when the background reads it so our foreground app can read it from there. So, in our app side GeofenceTask_Completed event handler we’d read the status and fill up a new textblock. You can definitely test the app on the emulator. Like always click the debug button with a emulator selected as the device and when it opens go to additional tools button and open up the location tab. Select a close location to your geofence, I did select a close one to my room and the status changed itself to “Entered”. It was that easy! You can even try the foreground example in the same way! Stay frosty! Hope this would help. Next postSee Sharp – Dependency Injection for dummies like me!